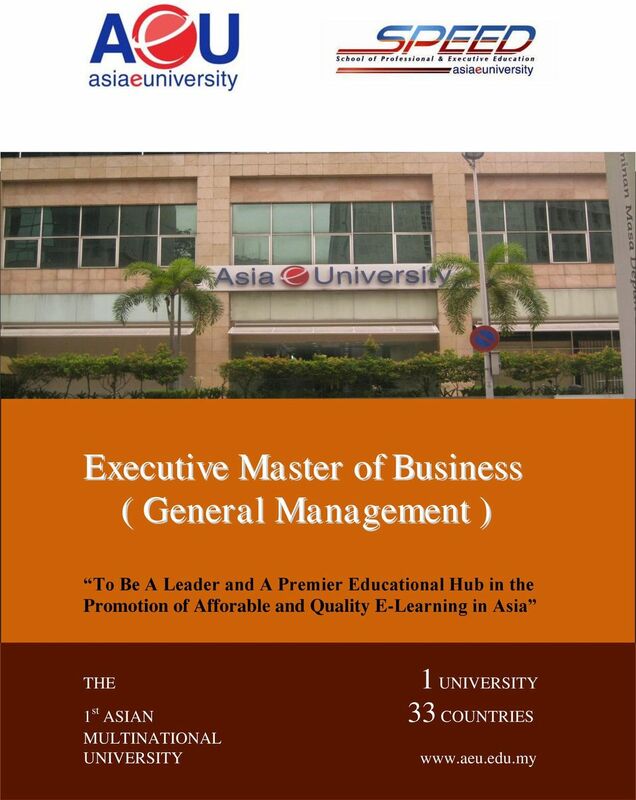 Download "To Be A Leader and A Premier Educational Hub in the Promotion of Afforable and Quality E-Learning in Asia"
3 A. Programme Offered : Executive Master of Business (General Management) - Organizational Behaviour - Project Management - Supply Chain Management - Human Resource Management - Corporate Finance - Business Law - International Business - Global Marketing Strategy - Operations Management - ASEAN 2015 Integration B. Objectives : To produce competent graduates with sound knowledge in business management and are able to solve problems effectively. To produce confident graduates with excellent management and leadership skills who are able to lead a multi-disciplinary team. To equip graduates with a broad education that will stand them in a good stead for future employment and career change. To develop graduates intellectual capacity in adapting to the rapid developments as they progresses in their career. 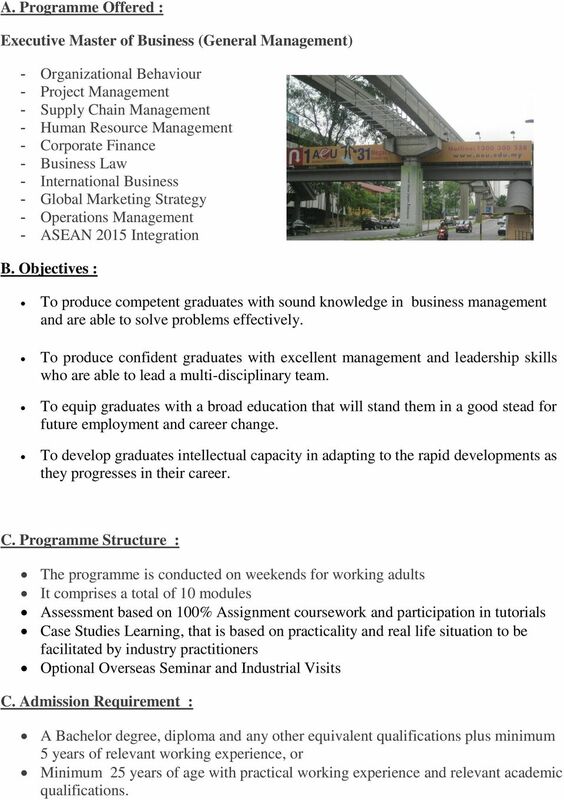 C. Programme Structure : The programme is conducted on weekends for working adults It comprises a total of 10 modules Assessment based on 100% Assignment coursework and participation in tutorials Case Studies Learning, that is based on practicality and real life situation to be facilitated by industry practitioners Optional Overseas Seminar and Industrial Visits C. Admission Requirement : A Bachelor degree, diploma and any other equivalent qualifications plus minimum 5 years of relevant working experience, or Minimum 25 years of age with practical working experience and relevant academic qualifications. 4 Key Features & Benefits 1. Programme designed for working adults Come and experience our quality, accessible, flexible and practical-oriented program for working adults. 2. Affordable Tuition Fees It is within the means of an average working person to obtain an extra academic qualification as the programme is one of the most affordable in the country. 3. 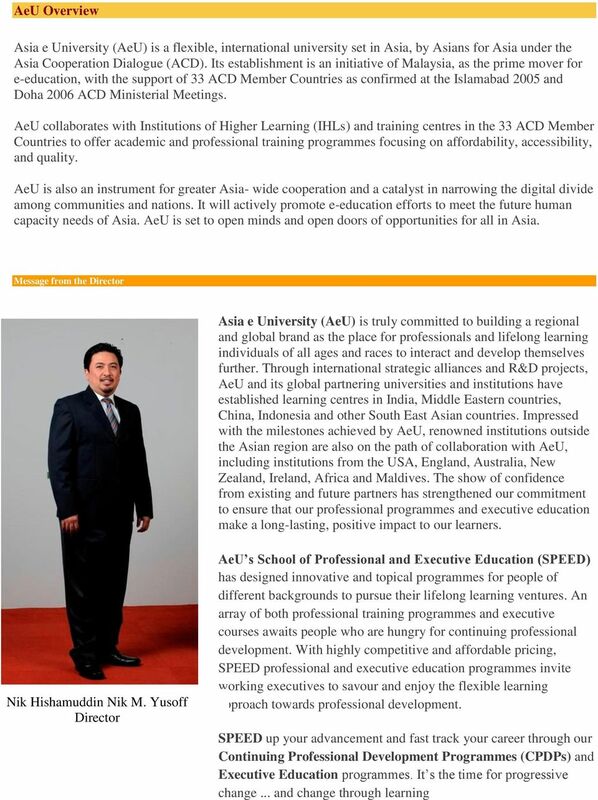 Proven in Malaysia since year 2008 AEU s continuing education programmes has been in Malaysia since year Thousands of students have successfully enrolled and participated in various programs. 4. Qualified and Experienced Lecturers All our faculty members are highly qualified professional who either posses a Master or a Doctorate degree. In addition, they have vast experience in their fields as industrial practitioners or corporate trainers. They don t just lecture, they facilitate and coach your learning. 5. Great Networking Opportunity All the students who have enrolled into the programmes are executives or leaders of their own respective industries. Most of them are involved in various industries like construction, manufacturing, consumer products, engineering, education, agriculture, IT, banking and consultancy services. This provides a good platform for networking opportunity among individuals and organizations for a Win-Win business partnership and exchanging of ideas. Well established in 33 countries : Afghanistan Bahrain Bangladesh Bhutan Brunei Darussalam Cambodia China India Indonesia Iran Japan Kazakhstan Korea Kuwait Kyrgyzstan Laos Malaysia Mongolia Myanmar Oman Pakistan Phillipines Qatar Russia Saudi Arabia Singapore Sri Lanka Thailand UAE Vietnam Tajikistan Turkey Uzbekistan SPEED, AeU Collaboration Partner : Bright Learning & Skills Development Centre ( managed by Bright Newstar (M) Sdn. Bhd.) P 4D, Desa Universiti Commercial Complex Jalan Sungai Dua,11700 Gelugor, Penang CONTACT OUR REPRESENTATIVE Any other qualification with minimum 5 years of relevant working experience.